In their first full year at the helm of the City, Chicago Mayor Rahm Emanuel and his Corporation Counsel have, to be kind, left much to be desired in the field of police torture and misconduct, wasting tens of millions of dollars in the continued unprincipled defense of convicted police torturer Jon Burge and his confederates, the police code of silence, and detectives who framed an innocent 14 year old boy. 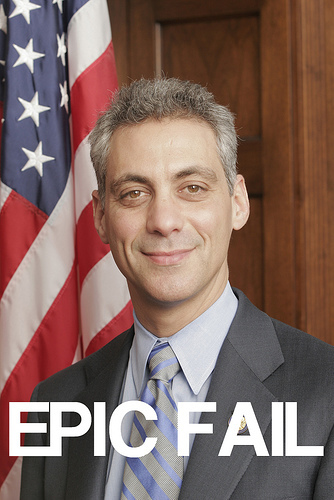 This blatant disrespect for the citizens of the City, particularly African Americans, was further demonstrated by the Mayor’s refusal to apologize to the victims of police torture and their families, to join with Illinois Attorney General Lisa Madigan in her fight to strip Burge of his police pension, and the failure to make good on his promise that he would end the torture scandal by fairly settling the remaining cases that torture survivors had brought against the City. In January, a Federal jury brought back a $25 million verdict against the City in a case brought by Thaddeus Jimenez, who, as a 14 year old, was framed by a Chicagopolice detective and spent 16 years in prison for a murder he did not commit. The City refused to settle the case before trial for a small fraction of the final verdict, choosing instead to follow the recommendations of its privately retained lawyers from Andrew Hale and Associates, who made a cool $2.5 million in fees defending the police detective. During the trial, Hale was cited by trial judge Matthew Kennelly for practicing “deliberate,” “invidious” “racially based” discrimination when he struck an African American from the jury during voir dire. In March, Federal District Court Judge Ruben Castillo dealt the City and Hale another blow when he granted a new damages trial to wrongfully convicted octogenarian Oscar Walden on the grounds that Hale and his partner, Avi Kamionski, engaged in “unethical” trial conduct. The City had paid Hale and Associates $400,000 to defend the case, and, after the ruling, paid another $1 million to Walden and his attorneys rather than to face a sanctions hearing on this misconduct and a re-trial. Throughout the winter and spring of 2012 the City, again using taxpayers’ money to fund private lawyers, fought to avoid, then to delay, the deposition of former Mayor Richard M. Daley, who had been held as a co-conspirator along with Burge and his confederates, in torture victim Michael Tillman’s wrongful conviction lawsuit. In July, when these tactics failed, and the deposition loomed large on the horizon, the City settled with Tillman for $5.375 million, but Mayor Emanuel, like Daley before him, pointedly refused to apologize on behalf of the City when called upon to do so. Also in July, Chicago Sun Times reporter Chris Fusco exposed Hale and his partner’s misconduct in a “Watchdog” feature, revealing that they had made more than $20.5 million in taxpayer money defending police torture and wrongful conviction cases. The City responded by declaring that it had conducted its own “investigation,” and had determined that it would continue to retain Hale in these cases. The City later refused to honor a Freedom of information Act request to produce its Hale “investigation” file. In November, a federal jury returned an $850,000 verdict against the City in a case where an off duty Chicagopolice officer had beaten a diminutive female bartender, finding that the beating was facilitated by the police code of silence. Before trial, the City, which could have settled for $400,000, refused to offer any money to resolve the case. After the verdict, the City compounded its arrogant miscalculation, first by publicly condemning the verdict, then by attempting to get the judgment removed from the public record. The trial judge refused to go along with this ill-advised attempt, and the City now faces a total bill of as much as $5 million in damages and lawyers’ fees. In December, the City’s defense of Jon Burge, Richard M. Daley and their collaborators again raised its ugly head as a federal jury was about to be selected in the case of Alton Logan, an innocent man who spent 27 years in prison. Logan alleged that Burge, who was represented by Hale and Associates, framed him, and Burge was scheduled to ‘testify” from his North Carolina jail cell by invoking his Fifth Amendment rights. The City, which had already paid $2.6 million to Hale and a battery of other lawyers to defend the case, successfully argued for a continuance apparently so that 24th hour settlement discussions could be conducted. Whether these discussions were fruitful is not yet known, but, once again, pinstripe patronage is an obvious winner. At the same time, the City continued to finance Burge and Daley’s defense in several police torture cases that, despite Mayor Emanuel’s promise, it has, to date, chosen not to resolve. In Ronald Kitchen’s case, for example, the City had paid Hale and numerous other private lawyers approximately $2 million to continue fighting the case, most recently trying yet again to block or delay Daley’s deposition in that case. Similarly, in Darrell Cannon’s case, the City has already paid $1.8 million to private lawyers to continue to pursue its argument that the $3000 settlement which it gave to Cannon before the torture scandal came to light, was not the result of an official cover-up but rather was fair and equitable. If 2012 is any measuring stick, it is fair to say that the new mayor is just like the old mayor when it comes to police torture and misconduct, the code of silence, and pinstripe patronage. Can we reasonably expect 2013 to be any different?